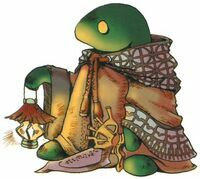 Physical Description (Or picture): Ferdinand has all the basic characteristics of a tonberry. Short stature, no hair, green skin, glowing yellow eyes and what seems to be a dolphin tail peeking out from the bottom of the back of his robe. In addition, he has a number of intricate tattoos depicting various eidolons running down the entirety of the back of his body, though they are rarely ever visible due to the hooded cloak that covers most of him. He also has a small tattoo on his forehead that appears to be a set of antlers. He wears a number of charm bracelets, as well as two necklaces. One necklace is a blue horn, while the other is a small cactuar. Craft of Karma: Ferdinand comes from a group of skilled warrior mages who combine knife fighting with magical abilities. These abilities all fall under the discipline known as the Craft of Karma, a discipline concerned with bringing justice to those who have done wrong. Diamond Dagger: Ferdinand channels the magic of the Ice Queen Shiva to encase his dagger in ice as hard as diamond, dealing damage. The more wounds the enemy sustains when diamond dagger is active, the more its joints are frozen. Dagger of Judgement: Ferdinand channels the magic of Ramuh to draw lightning to his weapon and fling it at his enemy, electrocuting them. Inferno Slice: Ferdinand channels the magic of Ifrit to surround himself with intense heat, his dagger becoming superheated and immediately cauterizing any wounds it creates. Titan's Sacrifice: Ferdinand stabs the ground with his dagger, channeling the magic of Titan to place a layer of protective stone on his skin, making him more resistant to damage and unable to be blown back by wind or similar great non-physical force. The stone armor is gradually chipped away as he takes hits. Whispering Wound: Channeling the magic of Sylph, Ferdinand stabs his dagger into the enemy and leaves it there. As long as it remains embedded in the enemy, it will drain its vitality and channel it to Ferdinand and his allies. Ruby Knife: Ferdinand channels the magic of Carbuncle, his dagger levitating in the air and putting up a magical barrier that reflects spells directed at him. It can be disrupted by knocking the dagger down with a physical attack or object. Doink: Ferdinand focuses all of his energy into the tip of his knife point, doing a large amount of damage with a seemingly little amount of effort. However, this is in fact greatly draining. He also rarely gets the chance to use it, as the focus required for this attack makes him very slow and easy to target. Karma: Ferdinand swings his lantern from side to side slowly, using the magic within it to bring forth the souls of everyone his enemy has murdered to do spiritual damage to his opponent that becomes greater over time. This attack can be resisted by enemies who truly hold no regret for their actions, and is ineffective against beings of lower intelligence such as animals. This attack can also be interrupted by knocking the lantern from Ferdinand's grasp. Tonberry Knife: Ferdinand carries the traditional knife that all tonberries carry into battle. It is very important to him, and he keeps it very sharp. Lamp: His lamp contains a feather of the eidolon Phoenix. Though it can be extinguished, it can always be relit, serving as a never-diminishing source of flame. It serves as the focal point of one of his most powerful spells, Karma. Being very small, Ferdinand is also very light. He's easier to damage than most combatants, and though usually quite speedy to make up for it he can be taken out of a fight with ease if caught while trying to use Doink on his enemy. He also has a tendency to trip. Background (Please keep this semi-short): Ferdinand comes from a sacred order of warrior mages who use the magic of eidolons to fight with their carefully crafted daggers. These mages were founded by an eidolon named Odin, who taught them honorable combat and introduced them to the various other eidolons attached to their order. It is his emblem that every member of this order has tattooed on their forehead. This order trained for many years, their base of operations being a gigantic eidolon named Alexander, who served as a mobile fortress for them. Albeit a very slow mobile fortress. Eventually they were attacked by the Magistrate, but with the help of their own abilities and Alexander's protective magic they were able to hold out long enough for help to arrive in the form of new inter-dimensional allies and help drive the Magistrate away. Ferdinand, a warrior and cook for the order, has decided to leave his home and help keep the peace in the rest of the multiverse and to learn more about these inter-dimensional forces of good that his home has been allied with for a while now.